Dr Charbel attended Macquarie University to achieve a Bachelor and Master of Chiropractic, then completed an internship at the school’s Summer Hill Outpatient Clinic and Research Centre. Many years ago, he attended a seminar where the philosophy of combining modalities of treatment was discussed. The combination of therapies may give patients optimum relief from their condition. Dr Charbel has definitely found this to be the case in his own experience, and that’s why he has chosen to include chiropractic care, massage therapy and physiotherapy at Active Life Health Centre. In practice since 2004, Dr Charbel first opened a clinic in Campsie before opening Active Life Health Centre in Croydon Park in 2014. He enjoys being in his home area, having grown up here and gone to school at Ashfield De la Salle. 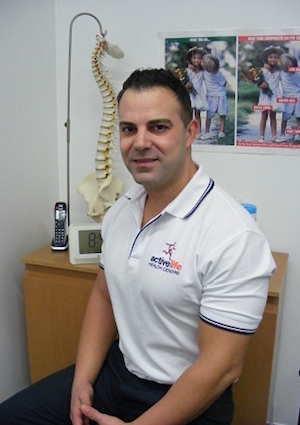 In his spare time, Dr Charbel enjoys keeping fit and healthy by training at the gym. He supports the Canterbury-Bankstown Bulldogs and is a member of St. Joseph’s Maronite Catholic Church in Croydon Park. Insurance is accepted at our practice. Contact us today to find out more about how we may be able to help you!